"I'm not the man today I was yesterday." - John O'Hanlan (James Stewart), in "The Cheyenne Social Club"
Being a well-brought-up young man, I was told to respect my elders, and that if I didn't have anything nice to say, I shouldn't say anything at all. You have now read my caveat for this mercifully brief review of this unimpressive double feature. James Stewart and Henry Fonda are without question two of the finest, most iconic actors ever to appear in American movies; I suspect that not even they or their fiercest partisans, however, would contend that either of these films mark their finest hours. In fact, watching The Cheyenne Social Club, you can't help but be a bit embarrassed for them, and it's even a relief when you get the sense that they're kind of phoning it in. Stewart plays John O'Hanlan, a laconic sort in the Old West; Fonda is Harley Sullivan, his manically chatty sidekick, in what I suppose is intended as a comic performance. Anyway, O'Hanlan gets a letter: his brother has passed away and left him a business establishment that's identical to the name of the film. The great big joke of the movie is this: the Cheyenne Social Club is a whorehouse. (Take a moment and gather yourself after those peals of laughter. It's okay, I'll wait.) Shirley Jones plays Miss Jenny, the madam of the establishment; O'Hanlan is torn by his new morally dubious standing as the town pimp, and his high status as the man that every other man wants to buddy up with, in the hope of getting a hometown discount. Well, it's not necessarily a disaster of a premise, really, and it's been put to good use in films as various as The Best Little Whorehouse in Texas and McCabe and Mrs. Miller. But this is little more than sniggering at the buxom lasses showing off their wares in what was regarded as scandalous frontier garb. The sexual politics of this movie are Cro-Magnon, and most of it is just embarrassing and smutty�it's like watching a football game with Grandpa, and hoping desperately that his hearing aid isn't working when the avalanche of ads for erectile dysfunction come on, with their friendly warnings that if you pop these pills and have an erection that lasts more than four hours, you should seek immediate medical attention. Perhaps if we just ignore it, it will go away. The pair fare better in Firecreek, which is much more somber, though only modestly more successful. It's a deeply conventional Western, with Stewart in the white hat�he plays Johnny Cobb, the local lawman�and Fonda in the black one, as Bob Larkin, who with his posse is terrorizing a frontier town. It's a wheezing tale, morosely put through its paces; if you've seen a couple of Westerns, you can connect all of the dots far before the characters do. But there's an honesty to the acting here, at least, from Fonda especially�much of it is unbearably ponderous, but you can see Fonda working it, the thoughts behind his haunted eyes. Then again, when you realize that this came out the same year as Once Upon A Time in the West, there's little doubt as to which Fonda Western from 1968 would be the better choice. 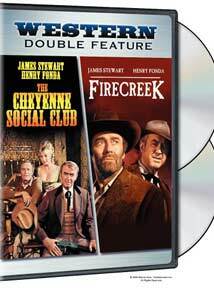 Image Transfer Review: Firecreek is the better looking of the two, with a sharp, saturated transfer; The Cheyenne Social Club shows some fading and neglect. Audio Transfer Review: Pretty clean audio transfers for both�and check out the French audio from time to time, because it might actually liven things up. Extras Review: Aside from an original trailer for each title, the only extra is The Good Time Girls (06m:22s), a making-of featurette for The Cheyenne Social Club featuring footage from the set. It includes Fonda and Stewart doing their best to push the product, though they both seem quite unhappy when they are, inexplicably, asked to sing. Another Hollywood legend, Gene Kelly, directed the feature, and he's here bragging that this is his first Western. Alas, it shows. The first half of the double feature is mortifyingly unfunny; the second, unbearably heavy-handed. Stewart and Fonda are rightly legendary, but not because of movies like these.